Structured packing tower separation performance depends on the internal parts, namely, packing, distributor and collector, etc. At the same time, it depends on many parameters, such as gas, liquid load, material properties, operating pressure, packing wetting properties and the uneven distribution of liquid and so on. So far not by packing geometry to the precise separation performance of the tower, need through the packed tower theory and through experiments under different conditions to determine accurate data. Users can according to the data level degree of approximation to determine the size of the tower height of packing and need. If you need any economic and reasonable structure form, our factory is willing to work closely with the users. 1, structured packing, high separation efficiency, rectifying column extraction yield high oxygen of air separation equipment, nitrogen extraction plant extraction yield and extraction yield of rectification tower two, because of complete sets of equipment withdrawal rate and capacity of air separation unit. Liquid product yield and other factors, it is difficult to measure structured packing separation efficiency high characteristic, rectifying column extraction yield, especially the ratio of high and low argon more representative design level of air separation equipment, checked by actual measured, a new type of air separation equipment has been put into production use. The rectifying column oxygen extraction rate has reached more than 99%; Argon withdrawal rate has reached to 79%. Structured packing tower and crude argon column has a high separation efficiency, is because of their operating pressure slash, the effects of the operating pressure is lower, it is greatly beneficial separation of oxygen, nitrogen, argon, especially the separation of oxygen and argon. In general, oxygen extraction rate can improve l % ~ 3%; Argon extraction yield can be increased by 5% ~ 10%. Extraction yield of rectifying column to a large extent also depends on the amount of expansion air into the tower, especially the great influence on the extraction yield of argon, thus improving the isentropic efficiency of turbine expander and booster pressure ratio, is a key to improve the extraction yield of distillation. 2, structured packing space is large, large production capacity, to narrow the gap to facilitate transport structured packing tower diameter rate can reach more than 95%. Orifice plate in the sieve plate tower area accounted for about 80% of the tower cross section, and opening rate of about 8 to 12%, are far less than the rate of airborne of packing layer, for the same load, the packed tower tower diameter smaller than the sieve plate tower; Normally its cross-sectional area only ~ 70% of sieve plate tower, the tower diameter reduced to transport for large air separation devices. 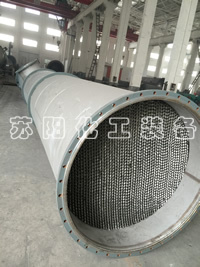 3, structured packing are less liquid, liquid in operation than and flexibility is bigger, variable working condition of the operation of the sieve plate tower load quickly by mesh liquid leakage and the limit of the speed, the packed tower is only limited by the liquid flooding velocity, so they load can be changed over a wide range of operation, packed tower design load range of 40% ~ 120%, the Shanghai factory is 12000 m3 / h oxygen air separation equipment on structured packing tower production in 9000 ~ 14000 m m3 / h range adjustment, operating load range is only 75% ~ 117%. Due to low volume of the liquid packed tower, generally only for tower volume by 1% ~ 6%, the amount of the liquid and sieve plate tower for tower volume 8% ~ N %, the liquid quantity is little, short staying time means that the liquid in the tower, the operational pressure drop is small, also is advantageous to the part load operation, but in the future operation mode in practice to verify. 4, device start time greatly shorten the start-up process of air separation equipment for product output operation, thus shortening the start-up time is one way of energy saving of the air separation equipment, air separation equipment start-up time refers to the time required to start the expander to the oxygen, by now the whole tower packing, after its normal distillation of liquid volume plunged after the start time of the air separation equipment greatly shortened.